Order your cod liver oil and high vitamin butter oil here for local pick up. And here to have it shipped to your door. What is the storage life of cod liver oil and butter oil? Green Pasture does not provide an official shelf life span for their cod liver oil or butter oil, but I called them and was told verbally that their products should be good for 2 plus years – even at room temperature. If you plan to stock up and store it this long, please note that at room temperature, the flavor of the cod liver oil may become stronger over time because it is fermented and will continue to ferment at room temperature. Therefore, we recommend that you keep extra bottles in the fridge or freezer. What do the flavors taste like? Do cod liver oil or butter oil need to be refrigerated? No, they can both be refrigerated or stored at room temperature, even after opening. It’s a matter of personal preference. Just keep the bottle out of direct sunlight. 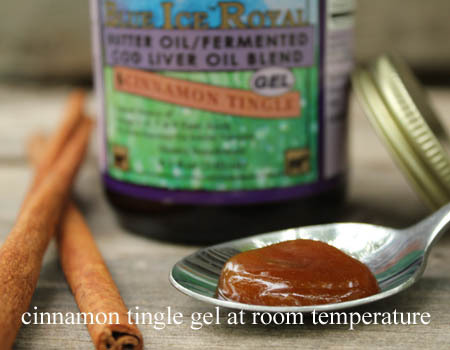 If you plan to keep your cod liver oil at room temperature, please note that its flavor may become stronger over time because it is fermented and will continue to ferment at room temperature. For this reason, we recommend that you refrigerate the bottle if it will take you longer than 3 or 4 months to use up. Some people prefer the texture of cod liver oil or butter oil when it is has been refrigerated, and others like it better at room temperature. Can cod liver oil and butter oil be frozen? Yes, they can both be frozen. 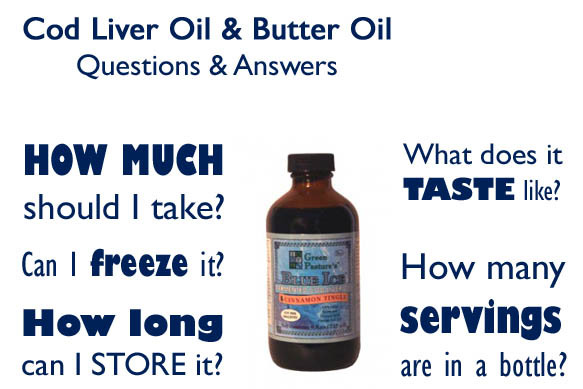 What is the difference between the liquid fermented cod liver oil and the butter oil/cod liver oil blend? Dr. Weston Price found that when “[a high vitamin] butter oil is mixed in equal parts with a very high-vitamin cod liver oil, it produces a product that is more efficient than either alone.” In other words, he got better results when he used the butter oil together with the cod liver oil. People healed remarkably faster when both were used together. Technical Differences: The liquid fermented cod liver oil is just cod liver oil. The cod liver oil/butter oil blend is two-thirds cod liver oil and one-third high vitamin butter oil, blended together for convenience. 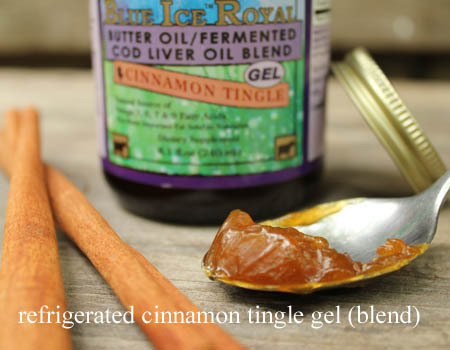 Taste/Texture Differences: I’ll compare the cinnamon tingle fermented cod liver oil (FCLO)/butter oil (BO) blend and the cinnamon tingle FCLO liquid. How many servings are in a bottle of cod liver oil? Butter oil? Cod Liver Oil/Butter Oil Blend: There are 96 half teaspoon servings. However, Dr. Weston Price recommended taking a half teaspoon each of cod liver oil and butter oil at the same time. 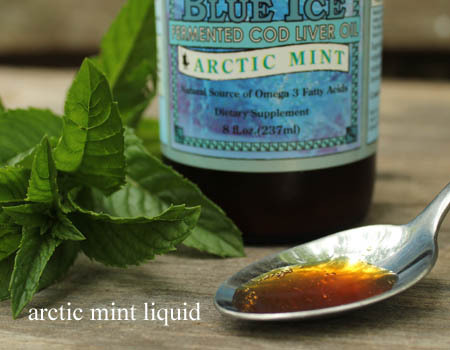 Therefore, you may want to take a full teaspoon of the blended cod liver oil and butter oil. 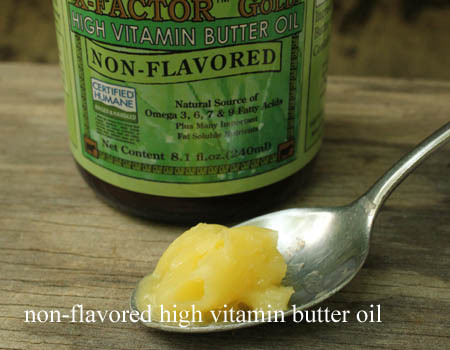 Do I need to take high vitamin butter oil along with the cod liver oil? If it is within your budget, yes. Here is an excerpt from the Weston A. Price Foundation that illustrates how much more effective cod liver oil is when taken with high vitamin butter oil. Why high vitamin butter oil? Can I use regular butter instead? It depends. Is your butter from grass fed animals? The high vitamin butter oil from Green Pasture (and also the ghee we offer from Pure Indian Foods) is made from the milk of cows grazing on the rapidly growing green grass during spring and fall only. This “butter that has the grassy flavor and the deep yellow to orange color… is usually several times as high in fat-soluble activators including vitamins A and D as butter produced from stall fed cattle or cattle on poorer pasturage.” (Nutrition and Physical Degeneration, Weston A. Price) It is also several times higher in vitam K2, whereas butter produced from cows eating grains and confined in stalls may have a little K2, but not much. So if you can get your hands on a good quality, grass-fed butter, you don’t need the high vitamin butter oil. Another thing that can substitute for high vitamin butter oil is raw, grass-fed cheese. Incidentally, vitamin K2 is also associated with a reduced risk of coronary heart disease and the prevention of arterial calcification. Will capsules give me the same benefit as the liquid? Or does the liquid need to come into contact with my teeth? Capsules will give you the exact same benefit as the liquid, and no, the liquid doesn’t need to come in contact with your teeth. It nourishes from within the body. I experience fishy burps when I take cod liver oil capsules. Try storing your capsules in the freezer. The cod liver oil will stay frozen for a little while after you swallow and thaw once it has safely arrived in your stomach. Problem solved! How much cod liver oil should you take? Please note that the fermented cod liver oil contains many co-factors that may enhance the body’s uptake and usage of vitamins A and D, and many people use half the recommended amounts and report results that are the same as if they had used the full amounts. Is there any research about regenerating adult tooth problems? Yes, it’s absolutely possible! Here is one story of a woman who healed six cavities in her own mouth using cod liver oil and butter oil. There is also a complete book on the subject, Cure Tooth Decay by Ramiel Nagel. The book is worth its weight in gold fillings. How much high vitamin butter oil should you take? Take the same amount of butter oil as cod liver oil. So if you are taking 1/2 teaspoon of cod liver oil, take 1/2 teaspoon of butter oil at the same time. We think Green Pasture has done an excellent job masking the fishy taste in their cod liver oils, especially the cinnamon flavors. 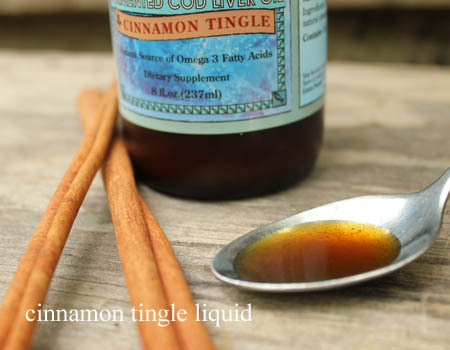 The kids in this video are tasting the cinnamon tingle liquid – their first time ever to taste cod liver oil. They can show you just how easy it is. But if you’re still scared, here are some practical suggestions to get it down. And if all else fails, use the capsules. My cod liver oil appears cloudy. Is this normal? 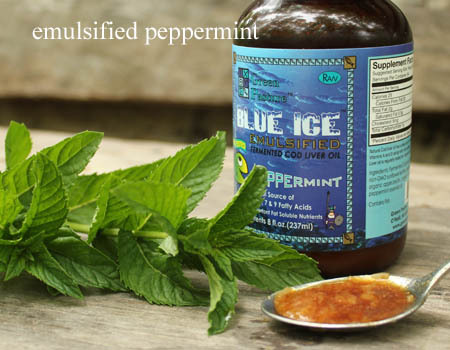 Cod liver oil may become cloudy or appear crystalized when it’s been kept in the fridge. This is normal and not an indication that it has gone bad. The date stamped on the side of my bottle of fermented cod liver oil or butter oil has passed. That date is the manufacture date, the date the cod liver oil (or butter oil) was made. It is not an expiration date. I Straighten Teeth, Sharpen Vision, and Create Beatuiful Clear Skin. What Am I? Would love to know the dosage guidelines on Green Pasture’s newest Infused coconut, skate, cod liver & butter oil, if you have it available. Thanks!! If I take the cod liver oil and butter oil combined will it replace the Essential Fatty Acids(fish oil) that I now take? I believe so, but I’d suggest you check the actual amounts of essential fatty acids and vitamins in each so that you know for sure. This article from the Weston Price Foundation details the nutrients in Green Pasture’s cod liver oil so you have something to compare with what you’re currently taking. Assuming both are grass-fed, are there special benefits that Green Pasture butter oil has over the ghee you sell? Thanks! Yes, both are grass-fed. Ghee is heated, and butter oil is extracted by centrifuge and remains raw during processing. The extra care involved to keep the butter oil raw is what makes it more special than the ghee. “Because of the fragility of nutrients and susceptibility to denaturation on exposure to heat, it is only through this very specific centrifuging process that HVBO yields a strong bioavailability of the X-Factor. In this form, the essential components of HVBO work synergistically with Cod Liver Oil to form the ultimate essential fatty-acid balancing duo.” This quote is from Radiant Life regarding the differences between high vitamin butter oil and ghee. 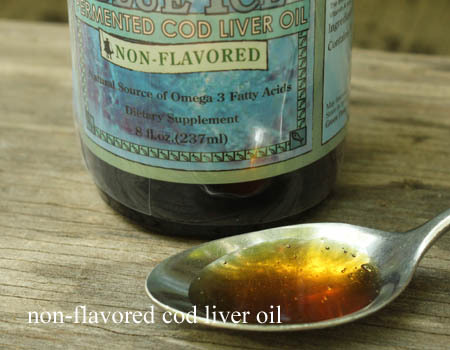 Your site states : Technical Differences: The liquid fermented cod liver oil is just cod liver oil. The cod liver oil/butter oil blend is two-thirds cod liver oil and one-third high vitamin butter oil, blended together for convenience. yet the diagram above where it lists how many servings per bottle lists 1/2 teaspoon of cod liver oil and 1/2 teaspoon butter equals the blend which is contradicting the 1/3 and 2/3’s ratio. You’re right. And I’m not quite sure how to resolve the discrepancy. 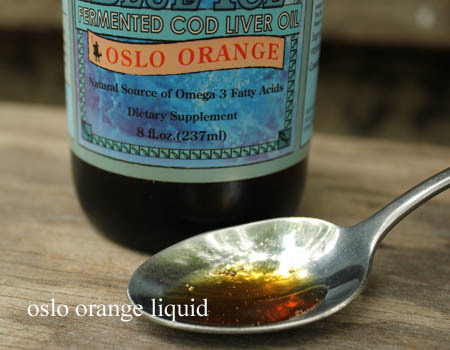 The idea is that if you’re wanting to get a full dose of cod liver oil and a full dose of butter oil, you should really take more of a teaspoon of the blend, rather than a half teaspoon (as the label directs). We asked Green Pasture why they made their blend a one to two ratio. The reason is simply because that’s what their customers were already doing. So although our diagram is not technically correct, it still stands to illustrate what we’re trying to communicate; that you should ideally take a little more of the blend than just half a teaspoon. Just wondering if cod liver oil will help with my 2 younger boys teeth. I just had them to the dentist and they say they have crowding and will need braces. They are still young so I would think I could start them on the oil and they would grow hoping that the teeth would stop crowding. Any thoughts would be a blessing to this mama. God bless you and your family! My dentist texted me back and says it’s not too late for the teeth that are developing. So for any of your kids that still have baby teeth coming out or adult teeth coming in, give them cod liver oil – it will help with the crowding. Can I use any cod liver oil. I picked up some from walmart. It was cheap but of course, I would rather have what ever works for sure even if it is more money. Let me know because I may need to order some of your special oils for my sons. I think it was on sale even. Thanks so much! The cheap stuff has been alkali refined, bleached, deodorized. Each of these steps removes some of the fat soluble vitamins. And most manufacturers also deliberately remove the natural vitamin A and D and replace it with synthetic. The special oils we sell are entirely natural, with nothing added and nothing removed. They are totally unique. Read the top 5 paragraphs of this article to see what I mean about the cheap stuff. The really cheap stuff is worse than nothing, based on what I’ve read. One thing to keep in mind is if you’re using a really good brand like Green Pasture, you can use less and still see positive results, because each brand varies in how much vitamin D and A it contains. Please note that the fermented cod liver oil contains many co-factors that may enhance the body’s uptake and usage of vitamins A and D; in fact, many have reported results equivalent to those obtained from high-vitamin cod liver oil with half the recommended dose, that is ¼ teaspoon or 1.25 mL for children age 3 months to 12 years; ½ teaspoon or 5 capsules for children over 12 years and adults; and 1 teaspoon or 10 capsules for pregnant and nursing women. Every day they take 5 capsules? Do they experience fish burps with this brand? My kids shudder at the fishy aftermath. Blue Ice Royal, I had that once, and I would chill it in the fridge, it seemed to cut back on that fish smell and taste. What is this brand like? I would love to invest in this, just afraid they won’t take it. I have a hard time getting them to take one cod liver oil pill. I see what you mean about the synthetics. I really would rather not do synthetics. You are a great help to us. Thank you! We haven’t really used the capsules much – actually, I don’t think we’ve ever used them. The liquid is quite a bit cheaper if you do the math. I have heard that some people freeze the caps and that cuts down on any fishy burps. Oh, and you can also get orange flavored capsules. They’re becoming pretty popular. Is the coconut oil / cod liver oil blend kosher? I talked with Green Pasture and learned that they are not kosher certified, so I checked into skate fish on wikipedia. It definitely is a type of ray, so no fins or scales. Thanks Erin I appreciate your research. I should of did the same before purchasing it. Is my memory serving me well that the solid ghee is a good substitute, or organic butter, for butter oil? If so, what are the doses of those? Thanks so much. Yes, both pastured ghee and pastured butter would be decent substitutes, however, these are pasteurized, whereas the butter oil from Green Pasture is raw. I think you can take 1/2 tsp ghee just as you would butter oil. I’m not sure what the dose would be for regular butter. How long is the cod liver oil good for after the manufactured date on the bottle? Green Pasture does not provide an official shelf life span for their cod liver oil or butter oil, but I called them and was told verbally that their products should be good for 2 plus years – even at room temperature. But if you do store it this long at a warmer temp, it will continue to ferment, which makes the flavor stronger. So we recommend that you keep extra bottles in the freezer and the bottle you’re using in the fridge. Experience has taught me the flavor gets too strong when you keep cod liver oil in the fridge for longer than six months. My personal opinion is that you should use it up within that time frame or freeze part of the bottle. I take it that includes all products? I have coconut oil infused with FCLO, manufacture date is April 2014, it’s been refrigerated. I know coconut oil is good for 2 years at room temp, so I’m assuming what I have is still good…? Yes, it should still be good.